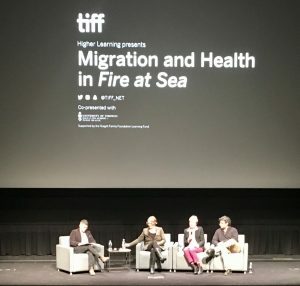 On March 3, 2017, the Dalla Lana School of Public Health in partnership with the Toronto International Film Festival (TIFF) hosted a screening of Fire at Sea, an award-winning documentary that illustrates the complex and compounding health issues facing migrants during their migration and resettlement. Approximately 150 students, faculty, community groups and movie-goers with an interest in global health gathered at the TIFF Bell Lightbox to watch a free screening of the film and participate in a panel discussion featuring scholars exploring the implications of migrants’ journey from a global health perspective. “Film is a powerful tool to engage people on global health issues, as we saw in the discussion after the film,” said Uttam Bajwa, who led the partnership with TIFF and is a post-doctoral fellow in the Dalla Lana School of Public Health’s Office of Global Public Health Education and Training. “Fire at Sea addresses a complex and timely subject,” said Bajwa, who worked with TIFF programmers and students from the Collaborative Doctoral Program in Global Health, including: Ifrah Abdillahi, Gurveer Bains, Virginia Gunn, Jesse Jenkinson, Sarah MacLeod, James White and Jannah Wigle to select the film. Fire at Sea is an Italian-produced documentary that portrays the arrival of thousands of migrants to Lampedusa, Italy, a tiny island in the Mediterranean Sea that in many ways is the face of the migration crisis, notably during the Arab Spring of 2011 when more than 60,000 migrants arrived on the island. The post-film discussion was moderated by Professor Lisa Forman, who is a Canada Research Chair in Human Rights and Global Health Equity, and included three panelists: Dr. Alison Mountz, Professor of Geography and Canada Research Chair in Global Migration at Wilfrid Laurier University; Professor Jennifer Hyndman, Director of the Centre for Refugee Studies at York University; and Dr. Meb Rashid, a family physician who specializes in refugee healthcare. The Together Project and Access Alliance also participated in the post-screening reception. Panelists described how the quiet calmness of the film is juxtaposed with the chaotic nature of migration and that the film is a good representation of how the right to sovereignty brushes up against the right to life. Maternal and child health, mental health as well as infectious disease were some of the health issues illustrated in the film. Dr. Rashid shared his perspective working with Syrian refugees in Toronto at the Crossroads Clinic, a clinic at Women’s College Hospital-based that offers primary health care during refugees’ first two years in Ontario. To close the event, Professor Forman referenced a scene in the film where the main character has his lazy eye diagnosed as a metaphor for how many countries are ignoring the global refugee crisis. “What do we need to do to enable the world to see?” Forman asked.